The Duck’s track and field team has always been known for their strength in the distances, but one of the problems is that they have so many talented runners it is hard to keep straight. Of the all the distance men, these are the top 5 who are expected to score big at the NCAA meet. Edward Cheserek is the obvious standout, being only a sophomore and winning 5 NCAA titles. He has the school record in the indoor mile, as well as being the winner of the Indoor 3K and 5K last year. Cheserek is known for his deadly finishing kick and is expected to win big points for the Ducks as an individual and also on the DMR. Eric Jenkins was runner up at NCAAs this past cross country season, and has run quite a few impressive races recently. Running a 7:44.91 3K at Milrose a couple of weeks ago makes Jenkins the 2nd fastest in school history. 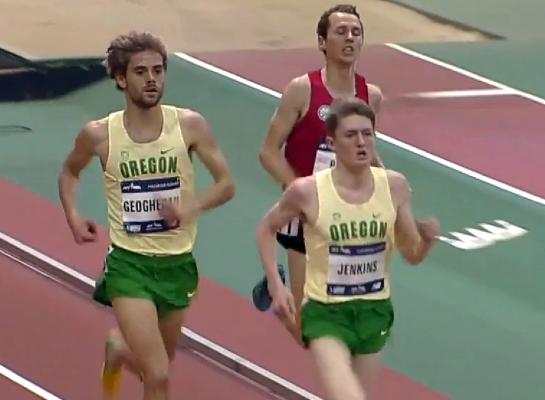 Yesterday Jenkins anchored the DMR at the MPSF championships and ran an unofficial split of a 3:56.78 mile, right behind Cheserek’s school record. Will Geoghegen, a transfer from Dartmouth, finished right behind Jenkins in the 3K at Milrose placing him 3rd on the all-time list. Geoghegan has also ran 13:43.22 for 5K this indoor season placing him 8th on the school’s record list. Johnny Gregorek, another Ivy transfer – from Columbia — came back from Milrose running a 3:57 mile, and ran an unofficial split of 1:50 for his 800 leg in the DMR. Daniel Winn broke the school’s indoor mile record running a 3:57 mile at the Husky Classic in Seattle the same day Cheserek broke it again. He placed 60th at NCAA this past cross country season and ran a 3:42.95 1500 last year. In terms of the male distance squad, these are the top 5 who are running well during this indoor season. 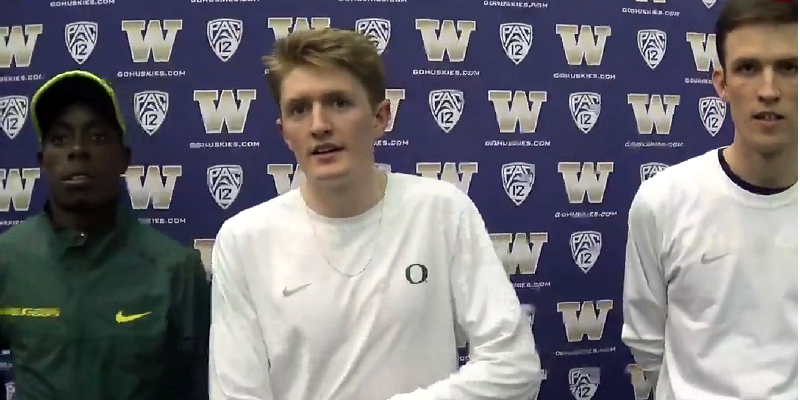 The Oregon men are projected to be major contenders to win the NCAA championship meet. Good luck to the Ducks moving on to NCAAs. Go out there and bring back another win to Eugene!